Ninety people at a single beach in Germany were treated for jellyfish stings in just three days, amid a surge of the creatures in European waters. Regional newspaper Ostsee Zeitung said "tens of thousands" of lion's mane jellyfish washed ashore at the weekend. The lion's mane is the largest jellyfish species, and while its sting is rarely fatal it often requires medical attention. One of the 90 people affected had a severe allergic reaction. Jellyfish numbers have dropped since the weekend peak, but the relief may only be temporary. Germany's lifeguard association said only a few specimens had been counted on Tuesday. But jellyfish tend to drift on currents, meaning water temperatures or a change in the wind could wash them ashore in droves again. Sudden plagues of jellyfish have been spotted across Europe in recent weeks. Sweden's west coast has suddenly found itself home to the clinging jellyfish - a species that Swedish broadcaster SVT said had not been seen there in 88 years. The tiny creatures are barely a few centimetres in diameter, and were only discovered when a marine biologist investigated reports of bathers being stung in the waters off Tjörn. Are swarms of jellyfish taking over the ocean? Another swimmer in the same area, Tobias Karlsson, told Aftonbladet newspaper that an hour after his run-in with the jellyfish, he had trouble breathing and suffered from cramps. 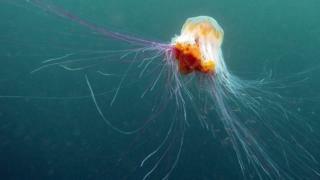 The same lion's mane jellyfish that plagued Germany's coast have been spotted in the waters around Britain and Ireland. Larger than usual numbers of jellyfish have been spotted off some French beaches, too. Is there a plague of jellyfish? For several years, reports have emerged that jellyfish numbers have boomed leading to unbalanced ecosystems, damage to fish farms, and many more underfoot on the sand. Jellyfish surface in "blooms" that carpet the surface of the sea. They can appear in huge numbers, moving like a swarm - lending credence to the idea that their numbers are ever-growing. The popular explanation is that human activity has over-fished the creatures' predators and that pollution has de-oxygenated the water - which eliminates their competition. Warmer ocean waters are said to help them grow faster, too. It is not entirely clear. Some 10,000 species fall under the generic "jellyfish" name - and they don't all behave, breed, or bloom the same. Still, that hasn't stopped attempts to solve the problem. An EU project called GoJelly has been launched to take the "annoying and even dangerous" creatures and turn them into something useful. While their main project is creating a microplastic filter out of jellyfish mucus to clean the oceans, they also think jellyfish populations could be controlled if humans ate them. They plan a jellyfish cookbook, and promise that the finished foodstuffs won't taste bad - "as long as the end product is no longer slimy".